AIM Dance is not responsible for students misplaced articles. Please mark all personal items and keep all belongings separate from other students in a dance bag. A lost and found basket is located behind the front desk. This basket is emptied periodically and all contents are donated. All students must complete a registration and policy form before beginning classes. New students may take one trial class free of charge before registering, however, if they decide to continue the trial class will count as their first class. The registration fee must be paid and all registration information must be provided before any further classes can be taken. All fees are NON-REFUNDABLE. NO EXCEPTIONS. Tuition is charged to a bank account, debit card or credit card on the 1st of every month. This information can be changed at anytime through the student portal. If you would prefer to pay tuition in cash it must be paid prior to the 1st of each month. After the 5th a $15 late fee will be added. NO EXCEPTIONS will be made for this. A $30 fee will be added to all returned checks. Tuition is due even if the student misses classes in order to maintain the students place in the class. Withdrawal from the program requires a 30 day notice and must be made in writing to the front desk or tuition will be due. All fees are NON-REFUNDABLE. NO EXCEPTIONS. No credits or refunds will be given. However, all classes may be made up. Regular attendance is vital to student progress and group choreography. Please make every effort to attend all classes. No refunds will be given for missed classes, however, a student may make-up missed classes by taking another class in the same style of dance during the month in which the class was missed. Please speak with the student’s coach regarding appropriate make-up classes for your student. If a student misses more than three of the final ten classes before the annual showcase they may be dismissed from participating in the showcase, at the discretion of the coach. Dance training is built on standards that reflect respect and professionalism. These include being prepared for classes by wearing the appropriate dress code, shoes and having hair done accordingly, listening to the instructor, and applying corrections and not wearing street clothes to class. We expect all students to arrive on time, be prepared to dance and display courtesy to parents, instructors and classmates. Tardy, unprepared or discourteous students may not be allowed to dance. Please continue to check your e-mail, the bulletin boards and posted signs for reminders and new information. AIM Dance can not be responsible for notifying each individual student of all reminders. During class hours, coaches are not available for discussion. Written messages may be left for the instructors at the front desk. Be sure to include a name and phone number if a return call is necessary. If a parent chooses, or if an coach feels it is necessary, a conference time will be arranged with an coach and parent regarding a students progress. Please walk young students into the studio at all times. Young students should also be instructed by parents to wait inside the studio until the person providing transportation enters the studio to pick them up. Please do not leave students at the studio for lengthy time periods. If an emergency prevents prompt pick up of your student, please call the studio to advise the student and staff of the situation. AIM Dance will follow the Branson Public Schools closings for inclement weather. Should inclement weather be a concern during school hours or on the weekend, please check your e-mail or our Facebook page for instructions. In most cases, classes will be held when schools are delayed due to weather; however, please check your email or Facebook to be certain. Students may take another class in the same style of dance during the same month to make-up for any classes missed due to weather. If you are uncertain of the make-up class for your student, please check with your coach. AIM Dance is more than just great dancing! Our dancers go beyond learning wonderful technique and poise to developing important life skills, learning to be respectful, confident and conscientious young people. They will learn an art that will stay with them a lifetime all while making new lifelong friends. 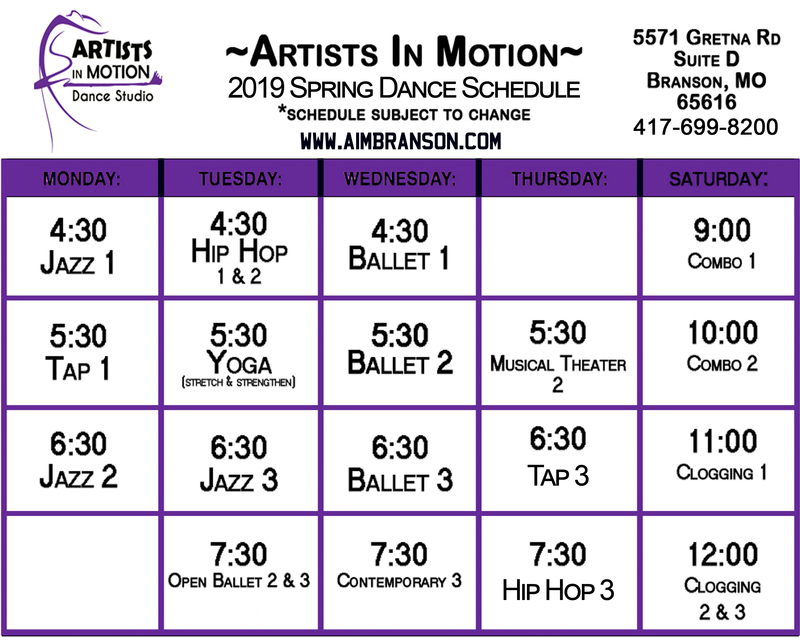 Current 2019 Dance class schedule. Subject to change. Offering all levels of dance from beginners to advanced. Any questions feel free to write us or call!